Spark City Market, a partnership between Indianapolis City Market and Big Car Collaborative’s Spark Placemaking program — with funding from a Southwest Airlines Heart of the Community grant — seeks an artist-in-residence to develop, facilitate, and engage in place-based programming. This will happen over five months in the remainder of 2018 at City Market with a start in August. The artist in-residence will work to bring engaging, interactive art experiences to people at this public place and further the partnership’s focus on social cohesion and community resiliency. Some of this work will happen in connection with social services partners such as Horizon House, the Coalition for Homelessness Intervention and Prevention (CHIP), and the YMCA at City Market. 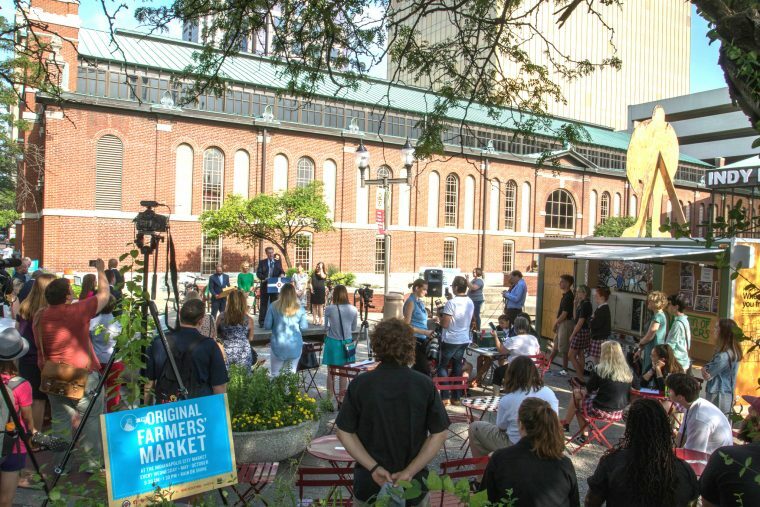 Spark City Market – Heart of the Community is a placemaking effort for public spaces in downtown Indianapolis, supported by Southwest Airlines and Project for Public Spaces in partnership with Indianapolis City Market. In 2016, Spark Placemaking partnered with City Market to plan and test ways to revitalize the market’s East Plaza into active public space. In 2017, they began implementing a plan that includes free games, various community and artist-led art activities, and multiple successful public events. This year, Big Car and City Market are continuing efforts to make Indianapolis City Market an even more active and inclusive space. The artist-in-residence will join in making this happen. Indianapolis City Market (222 E Market St) interior and exterior spaces. An Indianapolis-based artist is preferred, but it is not required. Open to artists of all mediums and practices. Open to artist teams and solo artists. Open to professional artists and students. Artists who have experience interacting with diverse communities are encouraged to apply. Artists with an interest in socially engaged approaches and social practice art are encouraged to apply. Spark Placemaking, the public programming wing of Big Car Collaborative, is seeking artists to create, facilitate, and engage in arts-based activities and performances during the summer, fall, and winter months at Indianapolis City Market​, Garfield Park​, and Lockerbie Marketplace​. They are seeking artists for paid, short-term activities/projects/performances that are non-commercial/non-sales in nature. This means that they are free for the audience/public. COMPENSATION: $100-$200 for a 1-2 hour engagement. Materials and supplies plus staff support are also provided. DEADLINE: Applications will be taken on a rolling basis from July through November 2018 with engagements scheduled for a date shortly after application. The Spark team collaborates with communities who invite Spark in to work with them to test and implement approaches for people-focused public places and streets. Led by artists, planners, and active citizens, Spark works to foster connectivity, community, culture, and creativity through engagement-based arts activities. This year, Spark continues its efforts to make Indianapolis public places more active and inclusive. A successful arts-based activity/performance — which can be one-time or a series — does not need to include all of these goals, but should include some. These artist-led activities are focused on, but not limited to, Indianapolis City Market (222 E Market St), Garfield Park (2432 Conservatory Dr), and/or Lockerbie Marketplace (333 N Alabama St). Artists can be from all genres including performance, craft, etc. Indianapolis-based artists are preferred, but it is not required. Artists who have experience interacting with community are encouraged to apply. Open to all art mediums and practices. 18 years or older, or with permission of a parent or guardian. Proposals will be considered on a rolling basis (July through November of 2018). Spark staff will work with you to identify a specific time and space for your project, if accepted. Expect to receive a reply from Spark staff within five days. Communication will be via email.